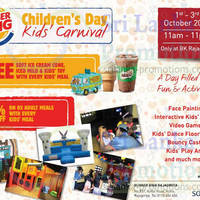 Burger King is having a Children’s Day Kids Carnival at its outlet at Rajagiriya . Click on thumbnail[s] to enlarge. Sales on 1 – 3 Oct 2015.